Maize, scientific name Zea mays, is a grain believed to be first domesticated by indigenous people in Mesoamerica during prehistoric times. This plant is commonly known as corn in most parts of America, and as Sweet corn in the UK (where corn is usually used to refer to wheat (England) or oats (Scotland)). Its seeds are called kernels, and are found in the corn ears produced by the leafy stalks. Maize is technically a grain that is often used in cooking as a starch or vegetable. It is one of the most widely grown crops in the United States, with over 872 million metric tons of maize being grown annually. Just like sunflowers[http://www.gardenershq.com/Helianthus-Sunflower.php], corn can be used ornamentally to create a beautiful backdrop to a garden. 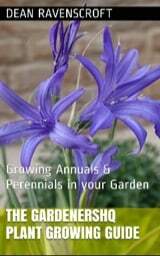 It is a worthwhile vegetable / grain for any garden as it provides a scrumptious and mouth-watering treat. It is a tender annual plant that belongs to the grass family and can grow up to 12 feet (3.7 m) tall. The soil should be well-worked, loose, and well-drained with a pH of 5.8 to 6.8. Aged compost should be added to the planted bed two to three weeks before sowing. Aged compost can also be added to the planting area during autumn. Since maize is a warm-season annual plant, it is best for it to be planted in soil with temperature that are above 60°F (15.5°C), two to three weeks after the last frost in spring. Sweeter varieties may require an even higher soil temperature of around 65°F (18°C). It may be necessary to keep soil warm by using a black plastic cover in cold areas (sow the seeds in holes). Depending on the variety, as well as on the amount of heat during its growing season, maize normally requires 60 to 100 frost-free days for it to reach harvest. Corns will most likely not germinate when planted in a cold, wet soil. The ideal growing temperatures should be from 60 to 95°F (15.5 – 35°C). Though best started outside from seed, if you do plan to start maize indoors, then do so two to three weeks before the last frost in spring, and transplant two to three weeks after the last frost. Start outdoors for best results. Sow seeds one inch (2.5 cm) deep a couple of weeks after the last frost. Space at about two to four inches (5 – 10 cm) apart in short, side-by-side rows to form a block of at least four rows, as opposed to single rows. This will aid in successful wind pollination. Once the plants reach about four to six inches (10 – 15 cm), thin the plants from 12 to 24 inches (30 – 60 cm) apart for tall variants or at about 8 to 16 inches (20 – 40 cm) apart for short varieties. Planting too closely will require more fertilizer and water, and lead to a smaller yield. Maize grows fast in hot weather and needs an even supply of moisture to avoid wilting. Always keep the plants moist by watering regularly. 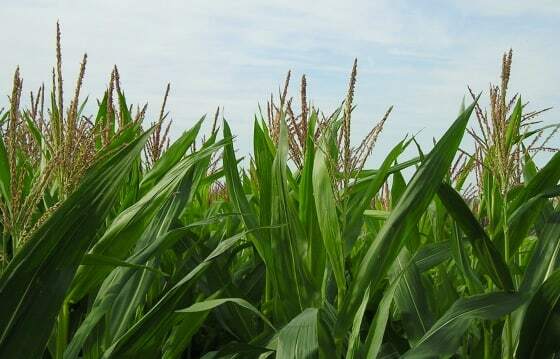 Do not water overhead, especially when tassels began to appear; water hitting the tassels during the time of pollination can reduce the number of kernels on a cob. Add aged compost and fertilizers that are rich in nitrogen, as corn requires a lot of these. Proper weed control should be observed to avoid competition for nutrients and water from the soil; be careful not to damage roots when weeding. Deep cultivation is also not advisable as corn is shallow rooted. These are thirsty plants so supplying mulch will help to prevent water evaporation. For maize to grow well, it is best companion planted with Peas, potatoes, cucumbers, squash, and pumpkins. Avoid planting with Green Beans or berries. Corn can be attacked mostly by wireworms, cutworms, corn earworms, flea beetles, and corn borers. Handpick and destroy pests, as this is the best method of control. Corn earworms deposit their eggs on the developing silks, which will later become small caterpillars that will feed on the tips. Placing a drop of mineral oil inside the ear will suffocate and kill the worms. Many rodents as well as raccoons can also attack the plants, so use fences or traps to exclude such pests. Depending on the warmth of the weather and on the variety of corn, the harvest will normally be ready about 60 to 100 days after sowing. Corn is ready to be harvested once the ears turn dark green, kernels become plump and soft and the silks turn brown. When a kernel is squeezed, the extracted juice should not be clear, but milky. Handpick the corn by seizing its ear and giving it a downward and sharp twist. Harvest is normally available 20 days after the appearance of the silk. Maize should be stored in a cool, dry place, away from moist to prevent fungi damage. 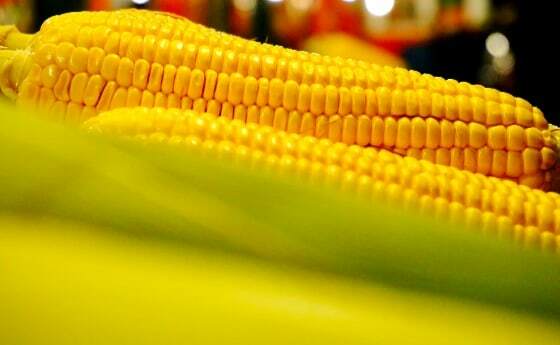 Sweet corn can be removed from the ear and frozen.